I’ve realized something recently, we don’t eat nearly enough burritos. I’m not sure why. 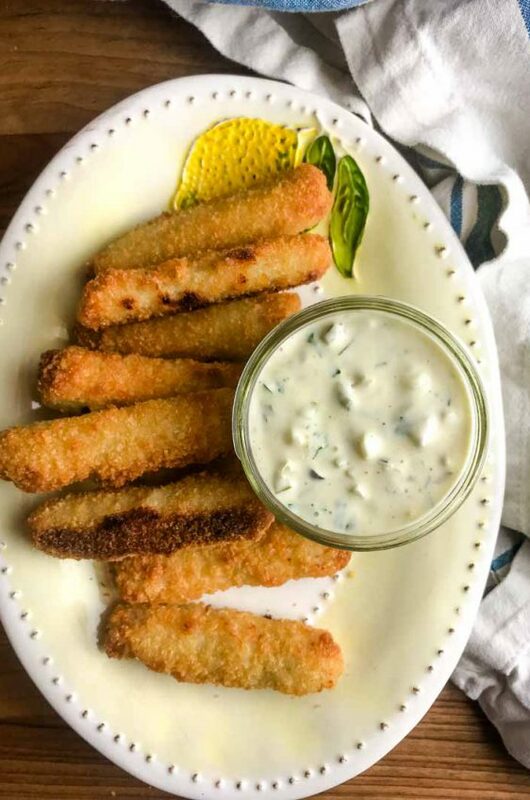 They are so easy to make and fill with whatever you like. You can do beans and cheese (always a fave) or one loaded with veggies, or beef or chicken or pork. The possibilities are endless really. 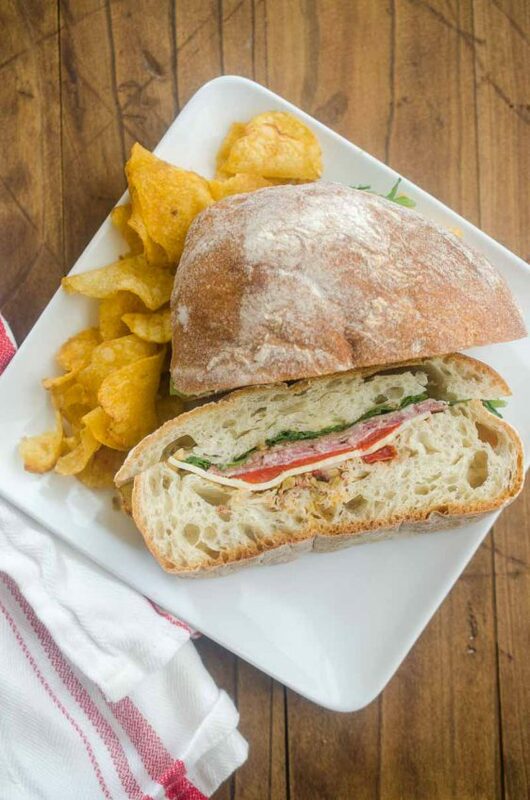 And you can get your protein, veggies and carbs all in one glorious bite. 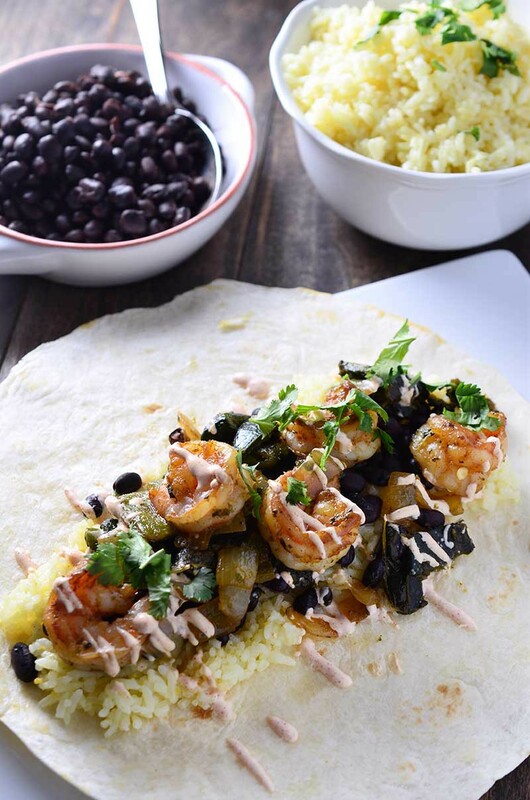 For this Shrimp & Roasted Poblano Burrito I stuffed it with all kinds of goodies: Shrimp, roasted poblanos, garlic rice, black beans and a drizzle of chipotle cream. Once Spring hits and there are more days with sunshine and blue skies, I start craving Mexican food. I don’t know what it is. Maybe it’s the because the flavors are so fresh and bright. Or that whenever I visit my family down in sunny southern California Mexican food is always on the menu at least a couple of times. Whatever it is, my brain is wired to see sunshine and crave Mexican food. Usually it’s tacos. I mean, really, tacos are good just about any occasion. However, every so often I need something a little bigger. A little heartier. Something like this Shrimp & Roasted Poblano Burrito. I’d like to say that this was one of those carefully planned out recipes but really, it was one of those “I want Mexican food, what do I have in the kitchen?” kind of meals. That is probably why there is so much stuff in it. This burrito does have a lot of components to it: the shrimp, the peppers, the garlic rice, the black beans and the chipotle cream but really it can come together pretty quickly. Especially if you make the garlic rice a head of time which I highly recommend doing. If the whole Chipotle burrito bowl idea is more your thing, toss out the flour tortilla and pile all this goodness in a bowl for a perfect burrito bowl. 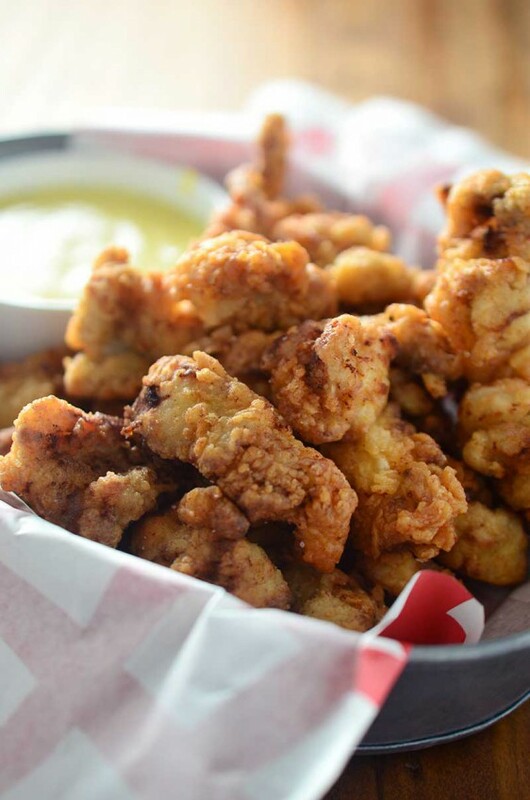 Want a few more veggies? This would make a fabulous salad too. Toss shrimp with salt, cumin, chili powder, garlic powder and olive oil. Cover and refrigerate for at least 20 minutes. Whisk together chipotle sauce ingredients. Cover and refrigerate until ready to use. Turn on oven broiler. Place poblano peppers on a baking sheet about 6 inches from the broiler. Broil for 5 - 6 minutes or blackened. Place in a paper bag for 10 minutes. Cut a slit vertically down the middle of the peppers. Carefully remove stems and seeds from peppers. Dice peppers. Heat a skillet over medium heat. Add in shrimp, peppers and onions. Cook until onions are softened and shrimp are cooked through about 5 minutes. While shrimp are cooking warm black beans. I haven’t been eating much burritos lately either and now I want one after seeing these. Never had them with shrimp before. OMG I’m totally craving this now. I eat fish and would love to make this over the weekend. Thanks for a wonderful recipe, and gorgeous photo!!! I’ve been craving shrimp & mexican food flavors lately. This recipe will be perfect! 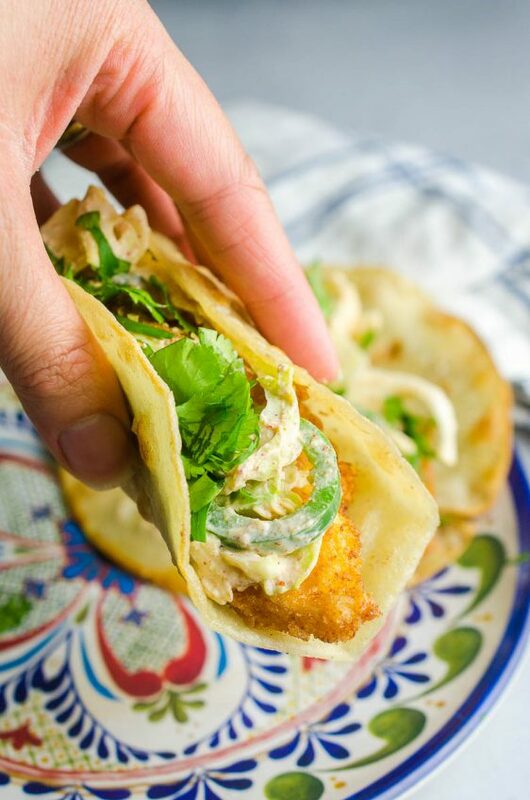 This looks so yummy – A great alternative to the old fish tacos! 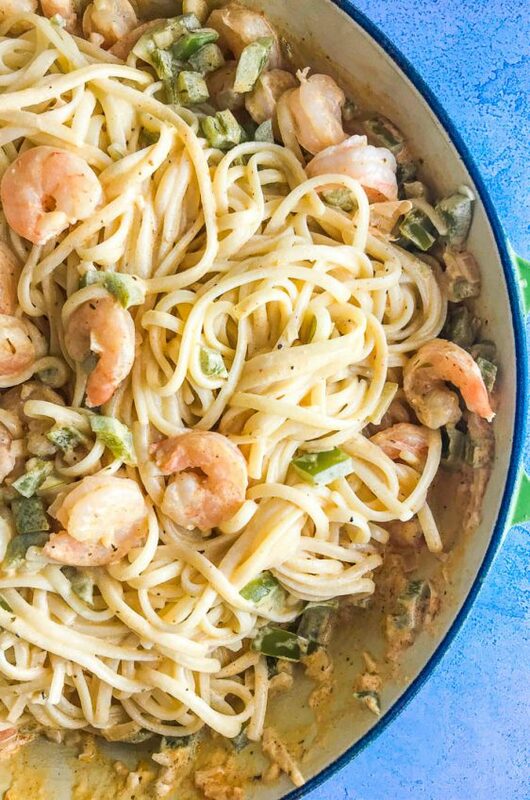 you had me at roasted pablano, and the shrimp, that is just the icing on the cake – SO good! I love it when I read a new recipe and think ‘I’ve got the stuff for that in my freezer’! Each August I walk down to my local grocery store and pick up a couple quarts of roasted Hatch chiles from the guy manning the chile roaster in the parking lot. I use some to make salsa verde with the farm share tomatillos and freeze the rest. After I thaw them, they are great in salsas, on pizzas, and in many dishes where a roasted hot pepper is just the ticket. I’ve still got a few left–as well as a bag of shrimp–so this is something I can make. My spouse is more a fan of the burrito bowl, though, so I’ll go that route. Looks really delicious! I’ve been craving Mexican food and I think I may have most of the ingredients. That chipotle cream is a nice touch. 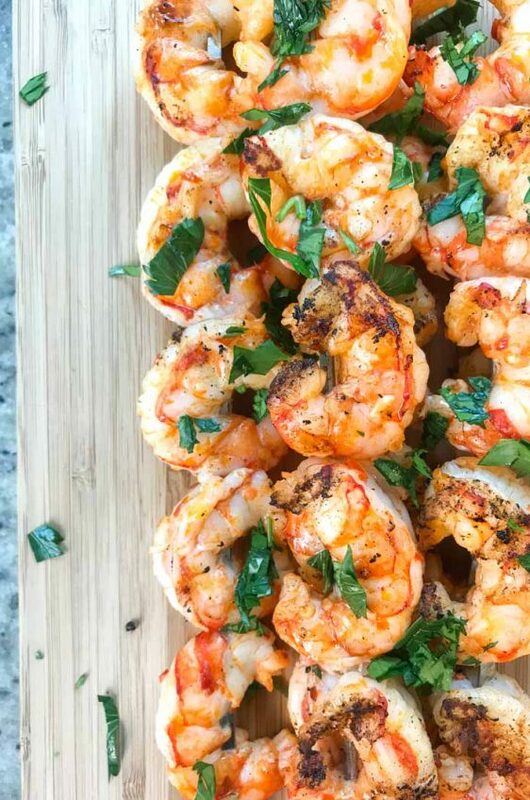 Anything with shrimp and I’m a guaranteed fan- These look amazing, Des!